What is the bounce rate of your landing pages? Mine is about 80%. The visitors who hit the back button or the close button make you absolutely no money, in fact they probably cost you money if you are paying for ads. 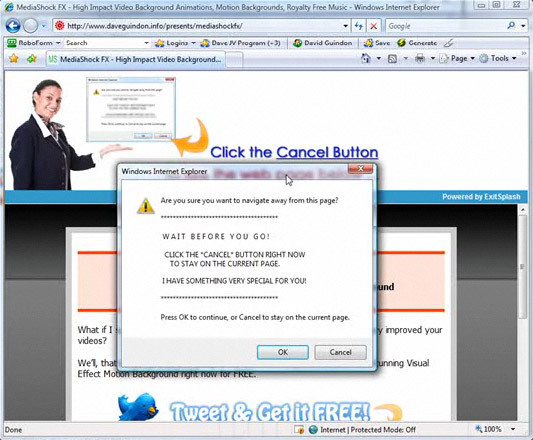 Using Exit Splash you can monetize these visitors who would otherwise have left – if a visitor tries to exit your site they will instead see a popup screen providing them with an incentive not to leave. This incentive could be a discount or a bonus if they choose not to leave and instead make a purchase. Take a look at Exit Splash in action – For example, I have 1000 visitors per day to one of my landing pages, 80% of them bounce. If I am not using Exit Splash those 800 bouncing visitors will make me no money at all, they are wasted. If I AM using Exit Splash 10% of those 800 leaving visitors will choose not to leave, they will choose to take up my discount or bonus offer, meaning an extra 80 interested visitors per day on top of my initial 200 non-bouncing visitors. Instead of the original 200 interested visitors per day I now have 280 per day, which equates to an increase in sales of 40%. Impressive, right? For a mere $67 you too can have Exit Splash. That purchase price will be paid back in just a few sales. Don’t miss this opportunity to increase your conversion rate overnight.